I tune aurally. Electronic tuning devices have their place, but I feel it is important to remember that high quality piano work is guided by the ear. 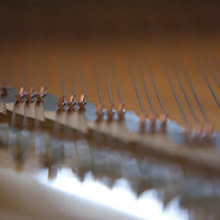 This aural piano tuning process involves precise listening as each note is given its proper musical place in the scale. This "listening with ears open" approach allows for a great tuning and enables me to further refine the tone of your piano. 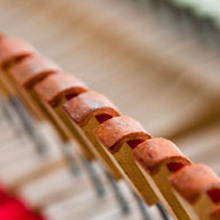 Good, solid, stable piano tuning is the bedrock of your piano's performance. Poor tuning will highlight and even create deficiencies in your instrument resulting in poor performance. 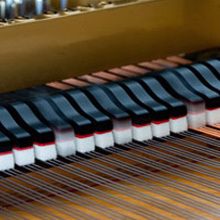 A great piano tuning, customized to your instrument, brings out its full potential. Much of what I can do for your piano, from voicing to action regulation to tone building, begins with a good tuning. My extensive concert-level experience with the Steinway piano at prestigious venues like the Aspen Music Festival and The Boston Symphony Orchestra ensures that your piano will receive expert care. During my initial visit, I will perform an aural tuning, evaluate your instrument, and then discuss with you in detail the options available to make your piano responsive and beautiful. These recommendations might range from minor refinements in voicing and action regulation, to one day in- home service for correction of larger action and voicing problems, to more in-depth projects that address larger performance problems. "Bryan - Thanks for a first-rate tuning! The pianos sound wonderful. I've just been playing the grand and had trouble stopping - it sounds so nice." My service area includes Columbus, Delaware, and the Greater Central Ohio area, including Columbus, Delaware, Powell, Upper Arlington, Dublin, Granville, Marion, Westerville, Sunbury, Kenton, Mount Vernon, Johnstown and other cities. Out of area: distant points in the Central Ohio area may incur an additional fee for mileage. Please contact me to schedule a piano tuning appointment.